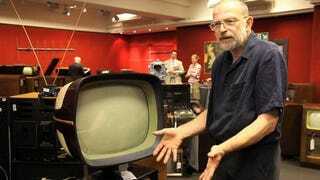 Historic tech collector Michael Bennett-Levy just auctioned off his collection in London, and amongst the goods was a Teleavia type P111, an HDTV from 1958. One look at this television and it's no surprise to learn that its designer was also responsible for the distinctive Citroen DS which was first produced in 1955. It features a 19-inch screen with white mask, in a tapered-hood case in deep purple with a gold trim. The controls and speaker sit in the rectangular box below and the screen can be turned independently through 150-degrees as well as angled vertically. The set is also "dual standard", with capability to show 441 lines (which became the standard from 1952) along with a high definition facility of 819 lines, meaning it is high-definition even by today's standards. This system began in France in 1949 but never really got off the ground. Bennett-Levy speculates that Teleavia may have been trying to "future-proof" the P111 in case the French government decided to resurrect the service.